Taha Yassin Ramadan was a member of Saddam Hussein's inner circle and was known as one of the Iraqi president's "enforcers". He was captured by Kurdish fighters in the northern Iraqi city of Mosul in 2003, about four months after the regime fell. One of the few surviving plotters from the 1968 coup that put the Baath party in power, he held numerous senior posts during the party's 35-year rule. His style was as hardline as Saddam Hussein's. When made industry minister in the 1970s, he reportedly told colleagues: "I don't know anything about industry. All I know is that anyone who doesn't work hard will be executed." Three decades later, as a judge at Iraq's High Tribunal sentenced him to death for his role in the killing of 148 Shias in 1982, Ramadan defiantly protested his innocence. "God knows I didn't do anything wrong," he told the court. "God will take revenge on everyone who oppressed me." The passing of the death sentence, imposed after he stood trial alongside Saddam Hussein for the killings in the village of Dujail, marked the end of a long career in Iraqi politics. Born to a peasant family in the Mosul area, Ramadan worked as a bank clerk after completing his secondary education. He rose through the ranks of the Baath Party, and joined the regime's powerful Revolution Command Council after the coup. He once led the Popular Army, a large paramilitary force tasked with protecting the regime. It was disbanded in 1991 when he became vice-president. 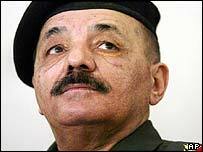 He was often sent abroad as the Iraqi leader's envoy. He apparently followed Saddam Hussein's orders faithfully - including once losing 27kg (60 pounds) after the Iraqi leader criticised his ministers for getting fat. Known abroad as a hawk who did not mince his words, he once suggested that Saddam Hussein and US President George W Bush should settle their differences in a duel with weapons of their choice. He lambasted the Saudi foreign minister, Prince Saud al-Faisal, when the Saudis proposed that Saddam Hussein step down in early 2003 to avoid a US invasion. "You loser. You are a minion and a lackey," he said, telling the Saudi prince to "go to hell". Ramadan once described the 1991 Gulf War as a victory for Baghdad since it marked "the beginning of saying 'no' to the forces of aggression". Together with Deputy Prime Minister Tariq Aziz and Foreign Minister Naji Sabri, he made the rounds of Arab nations during the pre-war stand-off with the United States. "US threats will not scare us," he was quoted as saying. Washington showed considerable interest in him well before the 2003 invasion, after opposition forces claimed he hosted Osama Bin Laden's deputy, Ayman al-Zawahri, in Baghdad in 1998. Shortly before the war, he told the pan-Arab MBC television channel the Bush administration "is Zionist... more Zionist than the Jews". Ramadan survived a number of assassination attempts, including two in 1997 and one in 1999. There are reports that he disagreed with Saddam Hussein over economic policies in the 1980s. Unlike others who took issue with the Iraqi leader, Ramadan lived to tell the tale, eventually standing beside his leader in court as some of his final dramas unfolded. In the end, however, he suffered the same fate, following Saddam Hussein to the gallows.